Celeste Araújo is a doctoral researcher and a film curator. She is part of the programming team of Xcèntric, the CCCB cinema, and she is preparing a doctoral thesis on Prometeo, Tragedia dell ‘ascolto by Luigi Nono, with long periods of research at the Archivio Luigi Nono in Venice. She studied Social Communication at the University of Minho and Advanced Studies in Philosophy at the University of Barcelona. 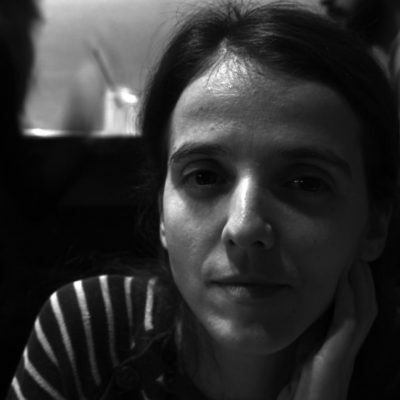 She has been a journalist at Público (Lisbon) and a member of the editorial board of Blogs & Docs, where she coordinated the section FUGAS dedicated to the experimental cinema. Her texts have been published in Musik im Metrum der Macht, Arte y políticas de identidad, Els Peus d’Ìcar, Blogs&Docs, Archivos de la Filmoteca de Valencia, Cinema Comparat/ive Cinema, Miradas de cine, Contrapicado, Transit and Público.